In the 1850s the shoppers of Leeds wanted something more than the open air market at Kirkgate. So the council decided to build a covered market. The result was a magnificent building influenced by the design of Crystal Palace in London. The market was opened in May 1857 and replaced the Briggate Street market, which had been at the heart of Leeds for over 650 years. In 1884 Marks and Spencer opened their first stall in the market. It was to become one of the most successful retail shops in the UK. You can find out more about how Marks and Spencers’ developed in our M&S learning story: Homegrown Expansion in Leeds. 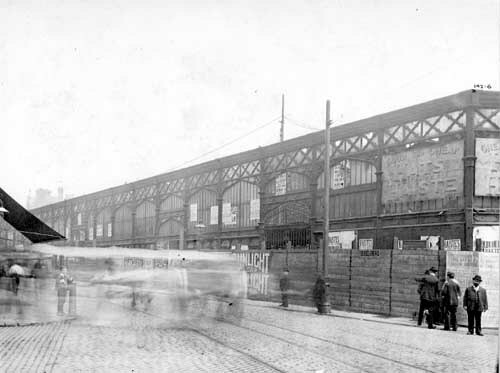 The amazing new market had 44 shops on the outside and 35 inside, where there were also four rows of iron framed stalls. At night the market hall was lit with 200 crystal gas lights. A huge variety of goods were sold in the market hall including fruit and vegetables, flowers, bacon, cheese, butter, cloth, books, nuts, brooms, flour, oatmeal and potatoes. There were some rules that everybody had to stick to though. Swearing, smoking and dogs were not allowed in the covered areas. 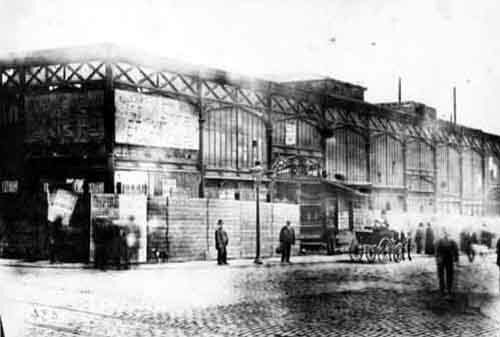 In 1857, Kirkgate Market was made bigger to make room for more shops. The new developments included a covered pig market that could hold up to 1500 pigs and a fish market. There were five entrances to the market, each with iron gates. At the market now you can find hundreds of different stalls. Can you list all the different types? There are stalls with food from all over the world. You could visit the market to see how many foods from different countries you can find.